– blueberries in pancakes for a yummy start to a warm Sunday morning. Which reminds me of Mother’s Day. My kids have started a tradition of preparing breakfast on Mother’s Day, but with my blog-writing, the stakes seem to have gone up. Boxed pancake mix just isn’t good enough anymore. So they rose early and three tries later, I was eating this plate of blueberry buckwheat pancakes without ever touching a utensil or turning on the stove. But the carved strawberries were the real star of the show, don’t you think? You’ve just bought the six-pack of strawberries at Costco or the Farmer’s Market and you only have 2 or 3 days to polish it off before they are past their prime. 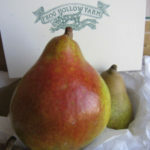 How about adding them into your salad ? I offered to bring a salad to the Teacher Appreciation Luncheon at my daughter’s school this week. Decided to make something simple but a little different. 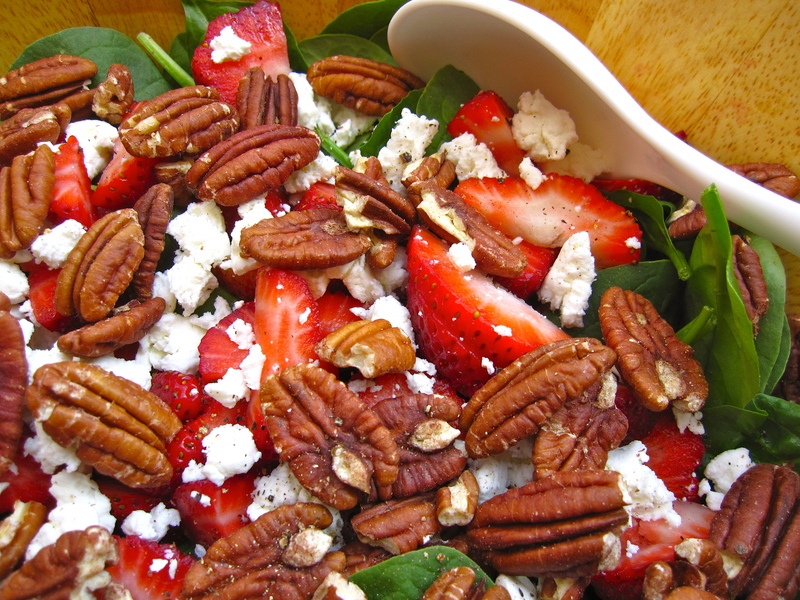 So I put together a spinach salad with goat cheese, toasted pecans, and strawberries, dressed with a homemade strawberry balsamic vinaigrette. I considered taking a shortcut and buying a bottle of salad dressing but after studying even the “healthy” versions at the grocery store, I just couldn’t buy the bottled dressings. They all started with sugar or water as a first ingredient. Why? 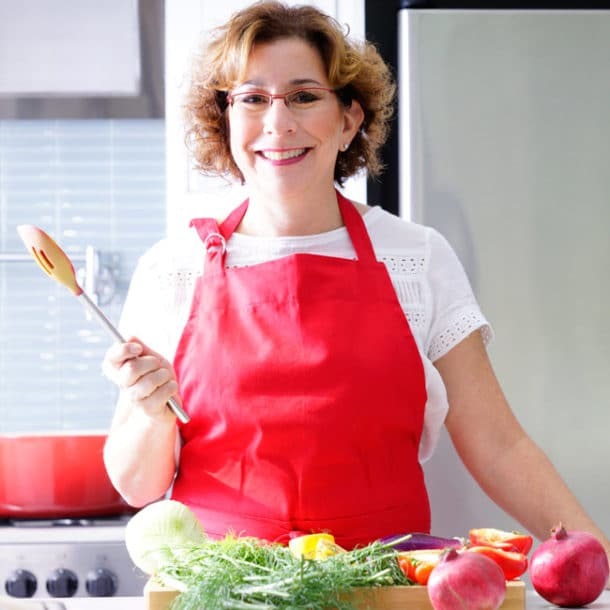 This post is not a rant on packaged food so let’s just say I decided to create my own. But it was oh so easy. And for dinner last night, same salad but with chicken on top and it became a main course. 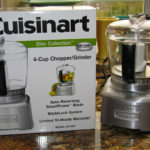 *You can toast nuts by placing on a baking sheet in a toaster oven or in a regular oven at 350 degrees for about 10 minutes. Keep an eye on them – they go from deliciously toasty to burnt rather quickly. 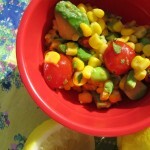 What is your favorite salad to celebrate the arrival of warm weather? 9 Responses to Ring in the Berry Season! That looks delicious! 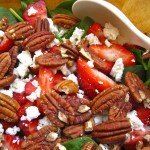 Really starting to love strawberries in a salad. I probably had it five times this pst summer. And homemade dressing! YES! I bet one of your mustards could be lovely in a different riff on the dressing! 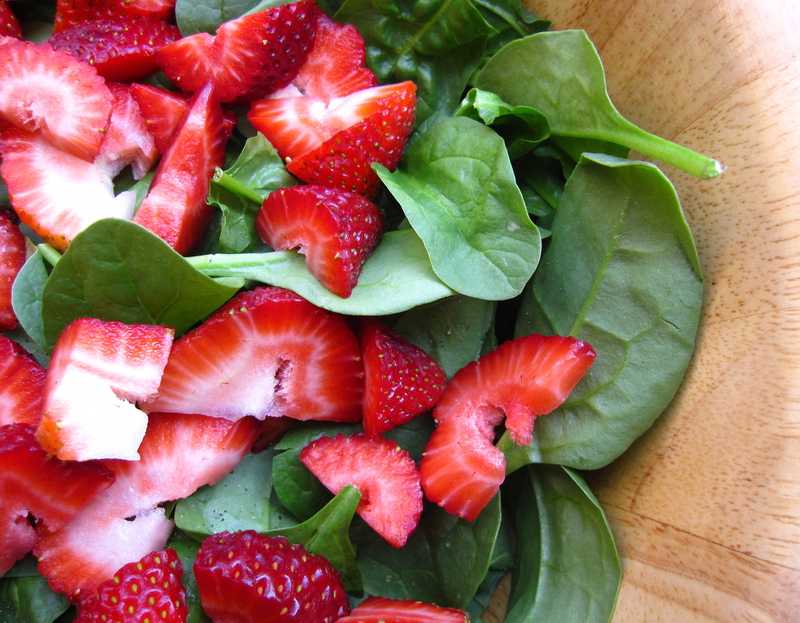 Oh the nuts, strawberries, cheese, and greens are just so beautiful together, so tasty, and good for you too. What could be better! 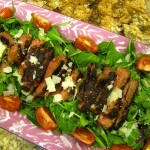 I would love to invite you over to THIS WEEK’S CRAVINGS linky party for Summer Salads. 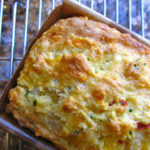 This recipe would be perfect, we hope you stop by and link it up! Thanks a million! 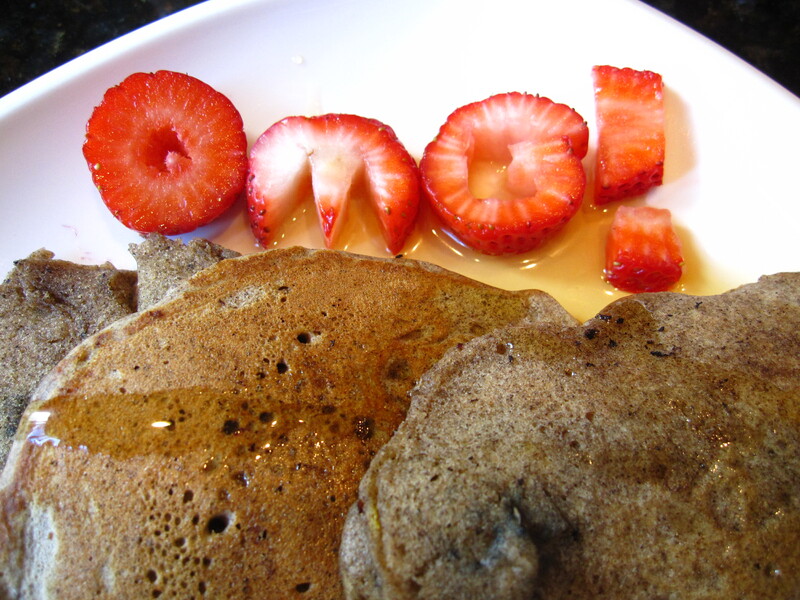 I love that OMG strawberries! 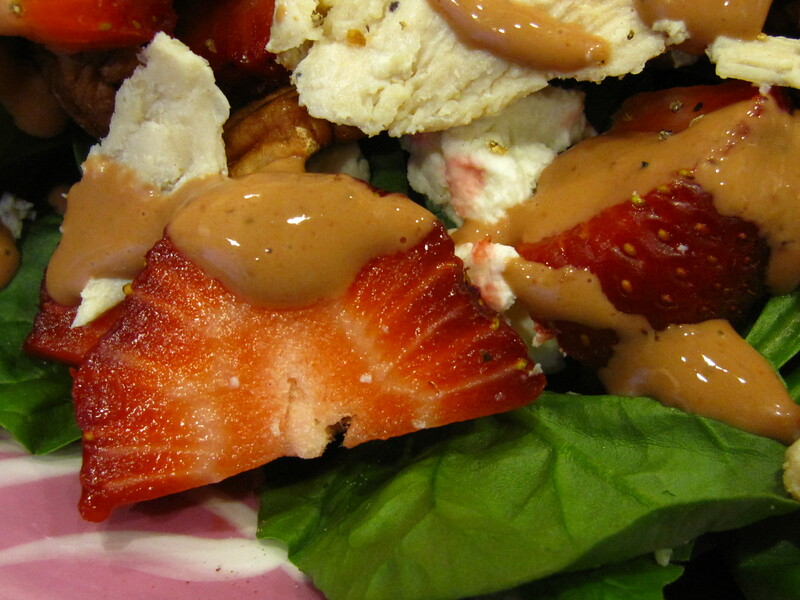 Strawberries and balsamic dressing is a match made in heaven. Wonderful ideas for spring strawberries! all looks and sounds delicious.